this is not a secret to regular readers...i use excellent quality extra virgin olive oil (e.v.o.o) in almost all of my recipes. i talk about it, blog about it, have dozens of bottles in my pantry...use it on everything...even as a face moisturizer...and try to learn everything i can about this liquid gold. 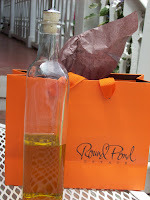 happily, the napa valley is emerging as one of the world's top producers so buying local oil is incredibly easy...you just need to know what to look for. "Beloved by “Fresh Oil Fanatics”, our fresh oil days offer a complete experience as our knowledgeable guides explain both our sustainable approach to olive cultivation and our time-honored olive oil extraction process. In addition, guests will visit the mill and savor samples of our fresh olive oil before making their personal “by the milliliter” selection." how cool does that sound? of course, this was an event i could not miss... peter and i...along with our good friend mary...met early saturday morning two weeks ago and drove to rutherford (about 15 minutes from downtown napa) to visit the estate. 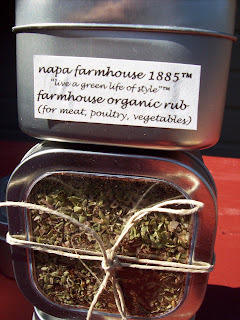 i blog often about the amazing food and wine produced in the napa valley. last year i shared with you the story of another favorite napa olive oil producer, long meadow ranch, in my story popcorn and olive oil?. today, i thought i would share a little bit about the production of olive oil in addition to telling round pond's story. fast forward to living in san francisco and then napa....suddenly, locally gown olive oil started showing up in restaurants and markets...i started meeting producers at farmer's markets and... slowly but surely...i stopped buying foreign oil (that sounds funny out of context) and developed a passion for e.v.o.o from the napa valley. first of all...the basic question...what is extra virgin olive oil? there are grades of olive oil...the simplest breakdown is extra virgin, virgin, olive oil and pomace...note, this is not a complete listing of the grades of oil...and i am not getting too technical because...why?? i think the main reason most people ask the question is so they will know what to look for when purchasing... fyi, i use extra virgin...and only extra virgin... in everything. some people use lower quality oil in their cooking...i do not. some people say you can't tell the difference once the oil is heated. i can...but make the decision that is right for you. it sounds obvious...but olive oil is made from the oil of olives...it is amazing how often i get asked this question...the easy answer is you smash an olive...remove the solids and the "olive water" and what is left is olive oil....the more complicated answer is the "how" of this process. 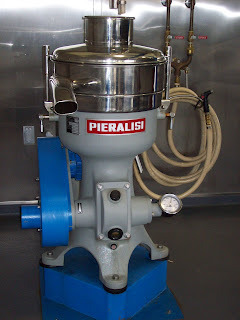 for years i have read about olive harvests...and the "press" that leads to olive oil. i had this totally romantic vision of making olive oil the way they do in small towns in italy. it takes a lot of olives to make a small quantity of olive oil...so italians having only a small number of olive trees bring their olives to a community press...old stone presses...and a process is created where the olives are all pressed and then you get to take home the amount of oil your olives have created. neighbors and friends gather around waiting for the olive oil to be finished...and they prepare fabulous meals while they wait...and then finish the dishes with some of the freshly made olive oil...what a party...what an experience. 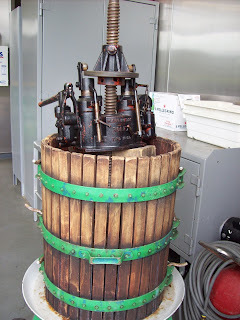 so it was this image i had in mind the first time i experienced an olive press here in napa. it was a couple of years ago and i was lucky enough to participate in the olive harvest for a local, organic farm. 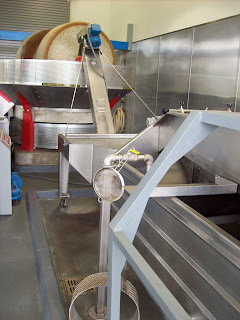 i then went to watch the creation of the oil at a small commercial press...oh man! i needed to lose my romantic imagery really fast....have you ever gone on a winery tour? 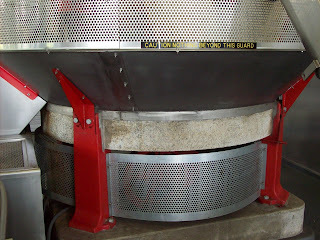 well, the process is similar...all stainless steel equipment behind loads of glass...sterile and clean...but so not the "historic barn, stone wheels, wooden barrels, fire pit grilling fresh bread to taste the oil" of my dreams. oh well, the process is still interesting...and attending the round pond event allowed me to ask a ton of questions....and.... while there is a lot of steel...they do use stone wheels...and no glass! so briefly...the process is as follows...the olives are harvested in late fall...timing depends on the type of oil you want to make...and how quickly the olives ripen in a given year. the earlier you harvest, the more green olives you will have...the greener the olives the "bigger" the oil. most olive oil aficionados covet really big "burn the back of your throat" oils. 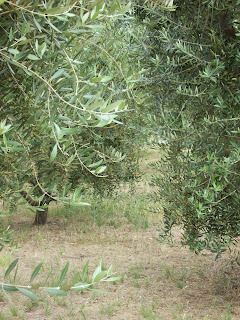 the later in season you harvest, the more black olives will be in the mix...this produces a much softer oil. green olives yield much less oil...which makes early harvest oils much more expensive...but so worth the price. remember when i told you that one of the characteristics of extra virgin olive oil is an oil with zero defects? to accomplish this, many artisanal producers, including round pond, handpick their olives...which makes the process incredibly labor intensive....the olives fall to the ground which has been covered with tarps. 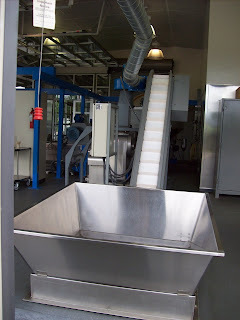 the olives are hand gathered and placed into bins which are rushed to the press. "These olives are pressed by variety in either a stone mill or hammer mill. Utilizing two different pressing methods allows us to extract contrasting characteristics so that we are able to create singular oils with unique charm, depth and complexity. 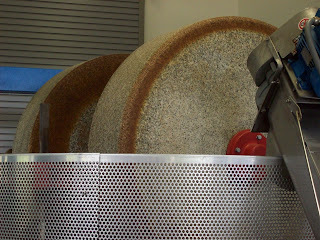 Traditional stone mill pressing provides less stress to the skins and pits, thereby exuding a smoother, less pungent oil; whereas, the hammer mill perforates the skins and pits of the olives to produce sharper, more robust flavors. 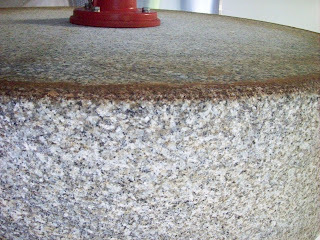 Once the olives are pressed and kneaded, the paste undergoes a separation process to eliminate any residual water so that the resulting oil is pure and concentrated. The oil is then funneled into stainless steel tanks, under nitrogen, until it can further settle. After a patient resting period, the art of the blend begins. Trained by Italian mill masters, our skilled team meticulously tastes each oil varietal, passionately testing dozens of blending combinations to achieve a perfect master blend that embodies an ideal balance of fruit, aromatics and warmth. Because the oil is precious – with each tree producing only one gallon of olive oil – we blend in extremely small lots and bottle on demand to ensure the richest, most vibrant flavors possible. " did you know there are thousands of olive varietals? i didn't until i started researching olive oil. round pond handcrafts two different blends of e.v.o.o., an italian blend and a spanish blend. the italian blend is made from early harvest frantoio, leccino, pendolino, morina and coratina olives. it is a big, peppery oil...nice when drizzling over grilled bread, fresh vegetables, and meats. the later harvest spanish blend...made from mission, manzanillo and sevillano olives is good for mixing with other ingredients...like in a vinaigrette. o.k. i told you this was part 1 of the story of my addiction to extra virgin olive oil...we have just scratched the surface of growing, harvesting and pressing olives. part 2 will cover tasting oils, discovering what you like, where to buy and how to use...fresh, in cooking and in baking. my site is full of recipes using e.v.o.o. and, although i usually include a couple of recipes in each post...today i am going to encourage you to use e.v.o.o. in its purest, simplest form. buy the best quality you can afford and drizzle over grilled/toasted bread...sprinkle with a bit of sea salt..and you are good to go. or try rubbing freshly grilled bread with a garlic clove before the e.v.o.o./salt finish....or rub the bread with the cut side of a fresh tomato..drizzle with the oil and sprinkle with salt....absolutely delicious....enjoy! i am. mangiafagioli means bean eater in italian. this is how most of italy refers to the tuscans because so many traditional dishes in tuscany use beans as a main ingredient. o.k...i live in napa but...since i am half italian...and eat tons of beans....i think the term applies. and it just sounds cool...say it...mangiafagioli. 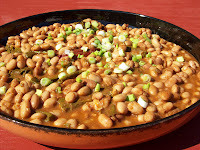 i told you a few posts ago how much i love cooking with beans in the story fresh or canned?...and provided a few ideas along with the recipe for my baked beans which calls for canned beans. i was wandering through the local farmer's market last week and spied fresh, dried pinto beans in a large bushel basket and dried garbanzo beans in another. i bought a bagful of each. now, i know that "fresh, dried" sounds a bit odd. what i mean is beans that have very recently been picked and dried. 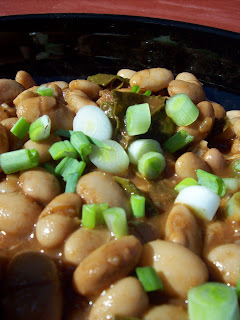 if you are used to dried beans from the grocery store, this will rock your world. you never know how old the beans are when you purchase them from large chains. i find that the older the beans are the tougher they are...no matter how long you soak them. freshly dried beans are tender and just taste better. they don't require as much soaking time but... since i use the "soak overnight" method...this doesn't really matter to me....the better taste does. 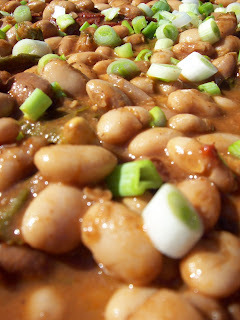 i find beans incredibly versatile...and add them to soups, stews, rice dishes and pasta all the time. so i soaked and cooked the garbanzo beans...then sautéed onions and garlic in extra virgin olive oil, added fresh sage leaves and the garbanzos along with grey salt and freshly cracked pepper...tossed the mixture with pasta and served with shredded parmigiano-reggiano cheese....delicious. 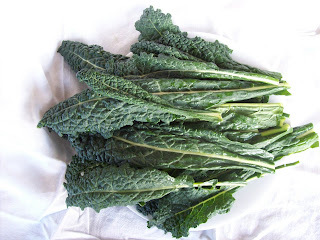 i decided to make a big pot of pinto beans last saturday because i could use them in a number of recipes this week and.... because i also had bought cavalo nero which is a black italian kale...i decided to create a beans & greens dish. 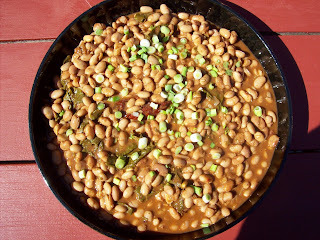 i served the beans the first night with a green salad and fresh warm tortillas and grilled a steak for peter. what a terrific dinner. a couple of nights later, i created our version of chili mac...heating up a couple of cups of beans...along with plenty of the bean gravy (the liquid that is created with the beans), added some cooked pasta...i used fusilli...and a couple handfuls of shredded extra sharp cheddar cheese, stirred until the cheese was melted and sprinkled chopped green onions on top....really, really good. last night, i poached a couple of eggs and served them on top of heated up beans...roasted some potatoes...and had brunch for dinner. place dry beans in large pot...cover with water to equal 2 x amount of beans. allow to soak overnight. do you love fava beans? 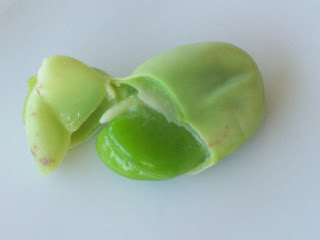 if you have never seen a raw fava bean you should know that they come in pods...kind of like a giant pea pod...and you split the pod to remove the beans the same way you do with peas...the difference is the "interior" of the shell. o.k....you are all going to know just how odd i am when i finish this description..but can't help it....i love this...the interior is made up of this spongy, protective "stuff" (have no idea of the technical term) that cradles and protects the beans. it makes me happy just to shell them...you can't help but feel really close to the farm...even if you live in a major city....and having friends and family participate in the shelling really does become a party. at this point the prep depends on the season...mid season, you need to peel each bean...very early in the season you do not...and you can eat them raw...straight from the shell...my mother-in-law, who was 100% italian, shared the tradition of inviting friends over...serving early season favas this way...everyone would shell their own beans...and eat with sea salt, pecorino cheese and wine...the shelling, eating, drinking, talking and laughing makes a terrific party. 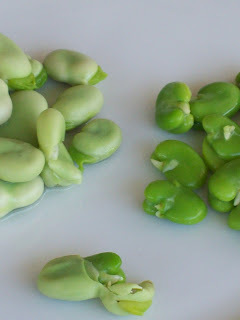 you are now ready to use your favas in your favorite recipes...they need just a quick saute and they are good to go. add favas, 3 tbsp e.v.o.o. and garlic cloves to saute pan...cook until the favas are tender and can be mashed easily when pressed with a spoon (10-15 minutes). stir occasionally during this step and add a bit more of e.v.o.o. if necessary. when favas are cooked, put the entire contents of saute pan...favas, garlic and the olive oil...into a food processor or blender. pulse until you have a chunky paste...i like some texture...but keep going until it is as smooth as you like. add additional olive oil and pulse again. the amount of oil depends on your preference...start with 2 tbsp...add the red pepper flakes...pulse again and season to taste...add additional oil if needed to achieve a smooth, spreadable puree. 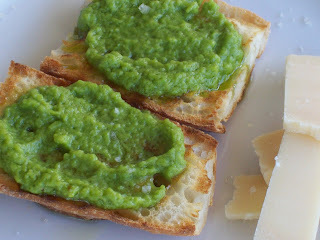 serve the fava bean spread with slices of bruschetta and pecorino or parmigiano-reggiano. 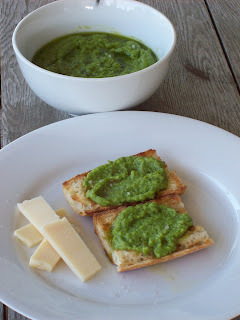 i spread some puree on a slice of bruschetta, top with a bit of cheese, drizzle additional extra virgin olive oil (best quality is important with this) and sprinkle a bit of grey salt....amazingly good!! 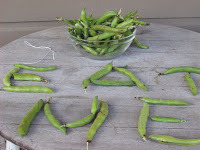 sadly, fava bean season is just about over...i waited way too long to publish this post...so, if you can, get to your farmer's market this week...see if they still have favas..buy them immediately...and try this recipe....you really will thank me..not that you need to...but i would love to hear what you think. 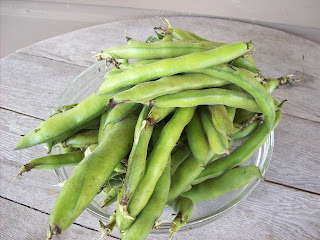 also, for fellow fava bean lovers...what are your favorite fava recipes? have a good week..and happy june! follow me on twitter...and please sign up for our mailing list on the right hand sidebar of this blog...thanks!